According to the Centers for Disease Control and Prevention, “Tobacco use remains the single largest preventable cause of death and disease in the United States. 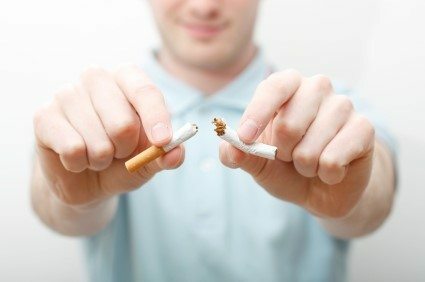 Cigarette smoking kills more than 480,000 Americans each year, with more than 41,000 of these deaths from exposure to secondhand smoke.” Smoking is the most significant risk factor for many diseases such as lung, laryngeal, and esophageal cancers, as well as coronary artery diseases, cerebrovascular diseases, chronic lung diseases, and gastric ulcers. This is an important health issue that has been emphasized all over the world. With statistics like this, is it of no surprise that nontraditional methods of cigarette cessation are increasing in popularity. However, which of these methods actually work? Mostly commonly, people hear about nicotine patches, gum, or drugs. However, acupuncture is a very successful way to treat the withdrawal symptoms of cigarettes. Acupuncture can aid in alleviating the severity of tobacco withdrawal symptoms. Individuals who are addicted can experienced a substantial reduction in the severity of their withdrawal symptoms. The intensity of the desire to smoke tobacco is combated through the activation of certain pressure points. Patients also will also experience improved mood, improved bowel movements and improved sleep. The most convincing reason for choosing acupuncture over other alternatives for tobacco cessation is that acupuncture is a completely natural path for trying to quit cigarettes. Some people cannot handle the harsh medications commonly used to quit smoking. Acupuncture does not have any negative side effects associated with these drugs. In fact, it only has very positive results. When you are wrestling with fatigue, irritability and gnawing sensations, acupuncture can help you to relax and overcome these sensations. Particularly, pressure points in the ears are proven especially effective in manipulating the body to suppress cravings. There are many theories behind the use of these pressure points. The cranial nerves, accessed through the ears, stimulate the nervous system to suppress the urge for cigarettes.